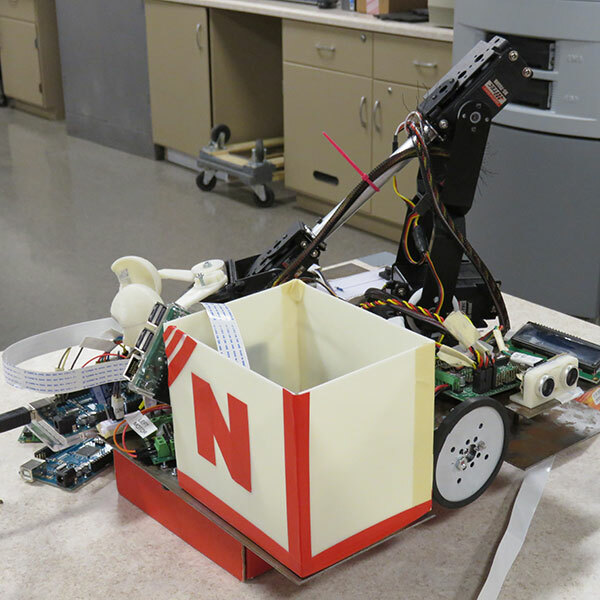 This robot is one that a team of engineering students in the UNL Robotics Club will use during a robotic harvesting competition at the ASABE International Meeting on July 31. A team of students from four College of Engineering departments will compete against others from around the world in a robotic harvesting competition July 31 at the annual ASABE Annual International Meeting in Detroit, Michigan. The diversity of engineering majors has been a somewhat intentional by-product of the recruiting strategy, said Santosh Pitla, assistant professor of biological systems engineering. Pitla, who specializes in advanced machinery systems, began recruiting students in 2014 to form an agricultural robotics team to compete at the ASABE conference. Pitla pitched his team at the Senior Design Showcase in April and at the university research fairs in the fall and spring and at other poster competitions. Three years later, in 2017, the Nebraska team took second place in the challenge, which required the robots to “prune” the correct-colored sticks meant to represent branches on a tree or vine. This year, the challenge is for the robots to harvest ripe fruit from a “tree” filled with ping-pong balls of different colors that represent fruit that is either unripe, ripe or overly ripe. The Nebraska team will be participating in both the advanced and basic competitions. Because the timing of the ASABE conference conflicts with summer break and numerous internships and work opportunities, Pitla said, only 10 members of the team were available for the competition. The growth of the program – it now has 35 members – and its success can be attributed to students realizing how unusual agriculture can be for an engineer and then rising to the challenges, Pitla said. “Agriculture is a really challenging environment – there’s dust, there’s rain, there’s water. There’s not a factory floor automation, where you can set up your robots in a clean environment,” Pitla said. “There’s a lot of opportunities for research and development. Getting them in the door, once they see it, students get really excited." And that excitement, Pitla hopes, could carry over into the future careers of the young engineers and could lead to solving some of the world’s biggest problems that aren’t far off on the horizon.